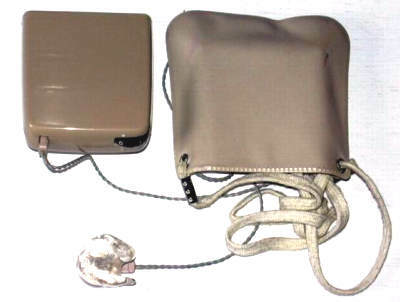 Medresco Hearing aid OL56 complete with plastic pouch and earpiece. Uses one AA battery. As issued by UK National Health Service (NHS) from 1958 until the 1970's. It was named after the Medical Research Council, which held an inquiry into hearing aid design and cost as the government made plans for the new health service. 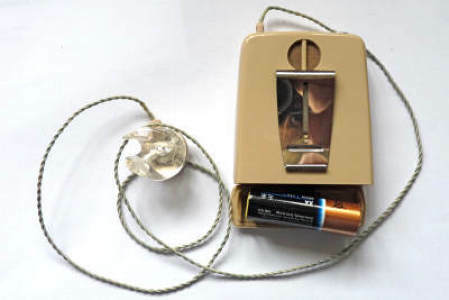 Development of early hearing aids for the NHS was provided by engineers at the GPO (the forerunner of British Telecom). This item which I believe was made in 1965 is still in working order. It was lent in 2012 to an 84 year old friend who had two modern devices, one of which he lost on his allotment and the other was left in his trousers which were subsequently washed. 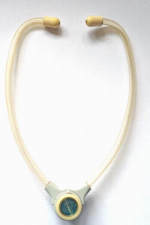 The earpiece would not fit his ear but the stethoscope type earphone from an old Grundig dictating machine which used the same little plug was pressed into service and served him well for several weeks. He admits that his two replacements are "quite good but not very good really". Ian Dyer who has worked at Whiteley's since 1968 advised that they also made the Medresco hearing aids.